Happy Tuesday MMT Family! 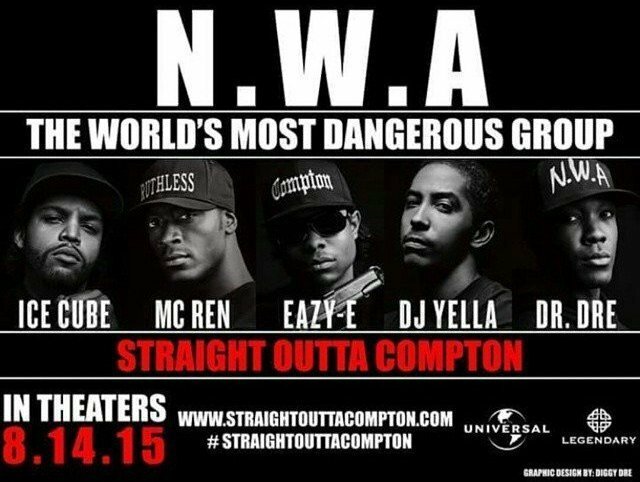 Okay Philly fam, we have your last chance to see the upcoming NWA biopic STRAIGHT OUTTA COMPTON before it opens next Friday, but you must be subscribed to this site to qualify! We’re giving away 15 pairs of passes to next Tuesday’s screening. To put your name in the hat, send an email to contests@musicmoviesthoughts.com with your full name in the body and the subject line “NWA.” Winners will be selected at random and notified on Sunday, August 9. Passes, like theater seating, are not guaranteed and theater seating is also based on a first-come, first-served basis. Checkout the trailer (caution: explicit language) for the movie below, and get additional information at the official website here.